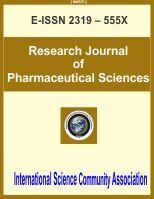 International Science Community Association are publishing an international peer reviewed journal Research Journal of Pharmaceutical Sciences. It is the vision of International Science Community Association to publish research papers, research articles, review papers, mini review, case study and short commutations in all areas of human study without financial restriction. Coverage Area: Researches in the field of Pharmaceutical science such as Pharmaceutical Chemistry and Drug Design, Pharmaceutical Analysis and Quality Assurance, Pharmaceutics, Pharmaceutical Nanotechnology, Pharmacology and Toxicology, Novel Drug Delivery Systems, Hospital and Clinical Pharmacy, Pharmacognosy and Phytochemistry, Pharmaceutical Microbiology and Biotechnology, Alternative Medicine, Polymer Science, Industrial Pharmacy, Drug Regulatory Affair, IPR (Intellectual Prop Rights), Molecular Modeling, Herbal Medicines.